This doily was one of my most recent finds. It seems to be a combination of blue and black cross stitching and backstitching on linen. Just the one corner has work on it but the little tassels are on all four corners. I have no idea what this may be called. Anyone? The picture of Dream in the snow is the one that I was trying to put up with yesterday's posting. You'll have to go between the two postings in order to read and view. As you can plainly see Blogger and I have been disagreeing over the photos again so I am posting this as is. I don't have time today to sit around and argue the point. Put the photos where you want to for this post Mr. Blogger. Cyalater . . . . Thanks for your comment on my blog about my Mail Art - lovely isn't it! Your blue doiley is a nice example of Assisi work. 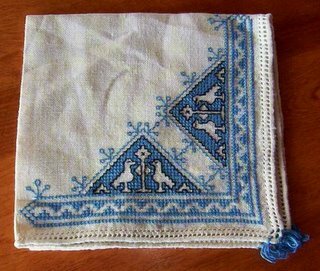 According to a DMC book I have on the subject, this embroidery style had its origin in the town of the same name at the beginning of the 20th century. It was based on embroidery of the 13th and 14th centuries that was preserved in the churches of the town. I have several examples of it in my collection, and I love it. I'd like to stitch some myself one day; it's not a lot different from Blackwork in some respects. and now you have snow, just like us ... but Christmas is just around the corner, so i guess it is ok - right? Assisi work is it? I wondered, but wasn't sure. I believe I saw a sample of Assisi work on your blog didn't I? Thanks for the info on it. Glad you enjoyed seeing the needlepoint work. How nice that your mother and sister do this type of embroidery. Maybe you could share some photos of their work on your blog? or do they have their own blogs? Yes, our snow has arrived and it's been lovely to watch it fall gently to the ground and cover the landscape so beautifully. As today is to be clear I am hoping to get outside with my digital camera and capture some of the gorgeous sights. Sparkling sun on gleaming white snow . . .
Blessings to both of you . . . and to all others who may pass this way . . .
Is that embroidery called Assissi work? I have a bookmark that is very similar. Dawn: beautiful picture! 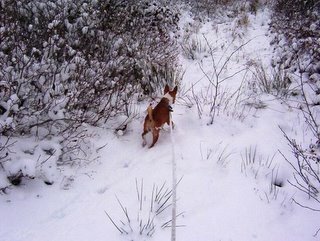 Love the dog in snow. All our snow has melted. The blue and black cross stitch is very kewl. Check out Gina's blog as she is the queen of 'finds' I enjoy seeing her treasures all the time!